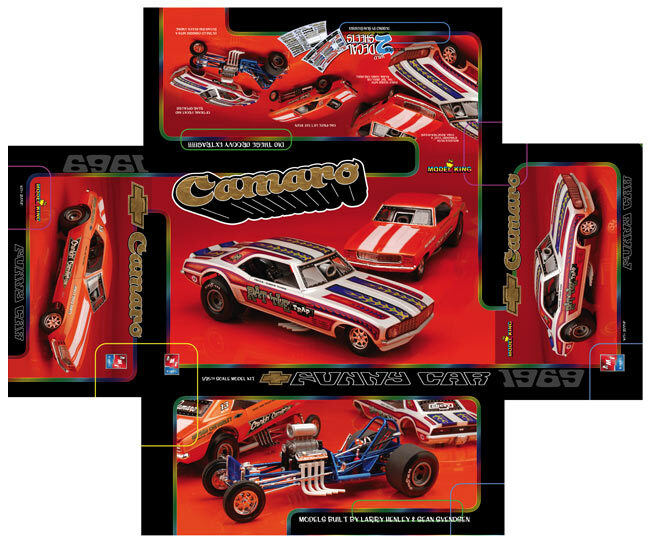 Here's a sample model kit box and decal design from my portfolio. 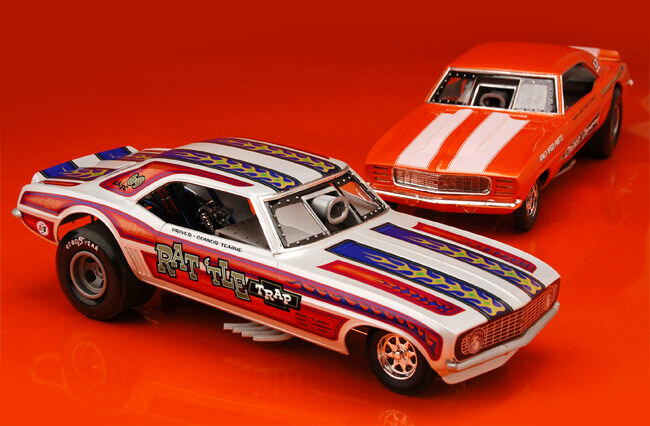 Click here to see other model kit boxes and decals I've designed. 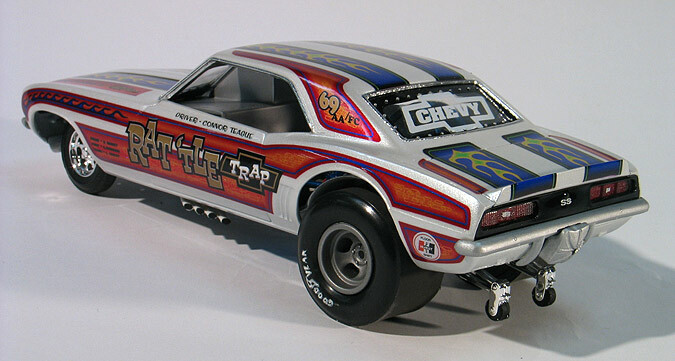 The fourth Model King project I did was the box art for the re-issue of the AMT '69 Camaro funny car kit. This was another ancient kit that had not been re-issued since the early '70's so I was excited to get to do this one. A twist this time was that Model King wanted to feature two models built by two different builders. I would build one and artist Larry Henley would build the other and we would design two different decal sheets and include them in the kit. Then after the cars were built I would do an illustration of the cars racing each other and complete the final box art. I contacted Larry and we decided to take different approaches for our models. Larry wanted to do a simpler, contemporary looking car while I wanted to do a psychedelic looking period correct car. We thought that would give the builders of the production kit some nice options for building. So with the plan in mind we both started building. 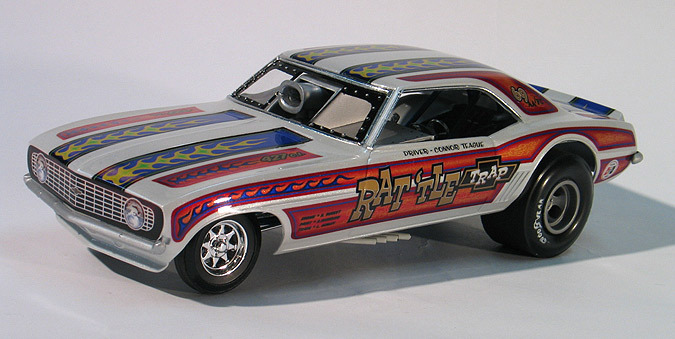 I started by searching the web for photos of late 60's funny cars to get ideas the paint scheme. I found a couple of multi-colored ones and used those for inspiration. I didn't want to replicate a specific car, rather just capture the spirit of the era. 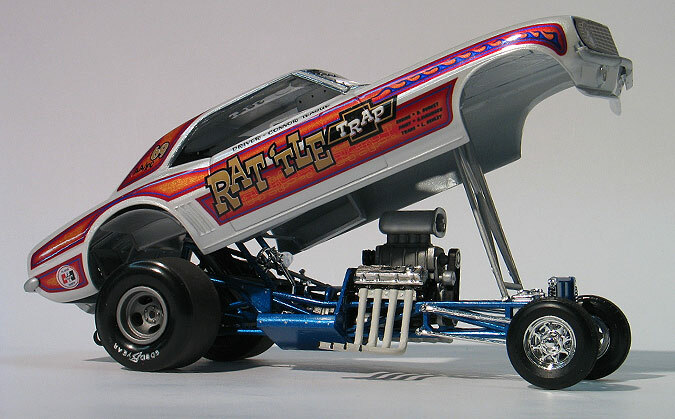 I also passed some names back and forth with Dave Burket and we settled upon the name Rat'tle Trap which was a reference to the big-block rat motor that comes in the kit. Meanwhile, Dave sent me a test shot of the kit which I measured and then I designed the logo for the car and created all the vector art for the decals using Illustrator CS2. I then made a set of prototype decals on my ink-jet printer. This was the first time I had ever attempted this process but it worked out really well. The model itself was built straight from the box. 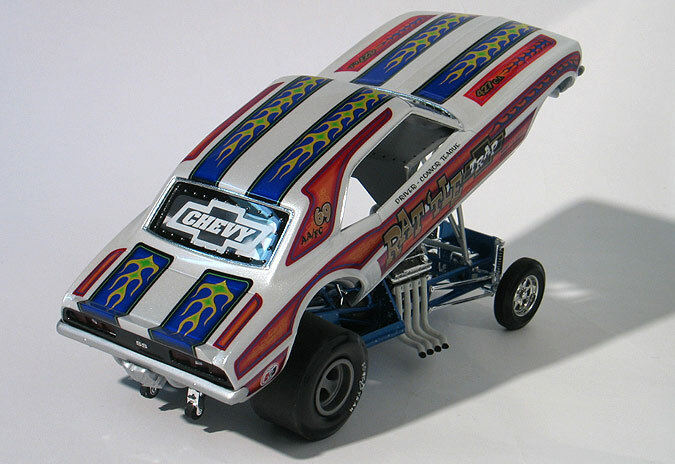 Because this was a funny car I also molded the hood and the blanked-off grill to make it look like one piece body. The paint itself was an automotive urethane pearl white with a urethane clear coat over the decals. 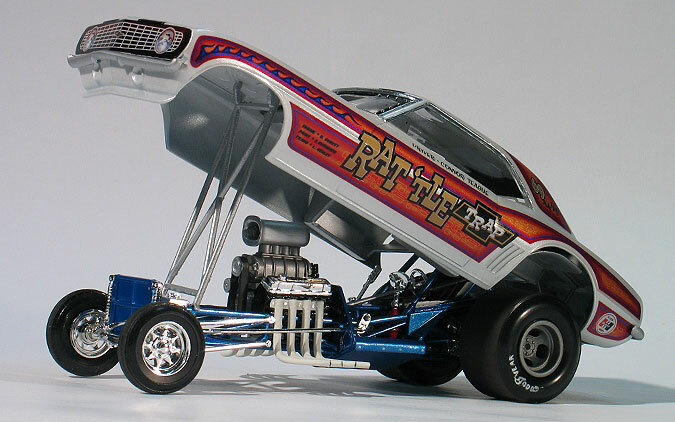 The chassis was painted with Tamiya spray can pearl blue. Some people have asked me why I still use spray cans when I have access to a large spray booth, professional spraying equipment and automotive paints. The answer is I pick the color first and just look for the easiest way to apply it. 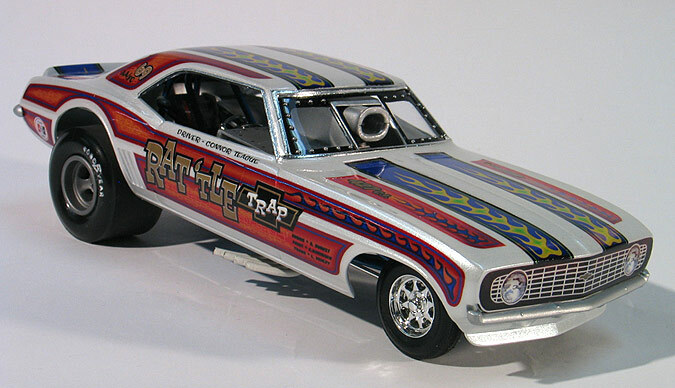 For most jobs, I can usually get just as good of a result from a rattle can as I can from an airbrush. One note about my chassis. 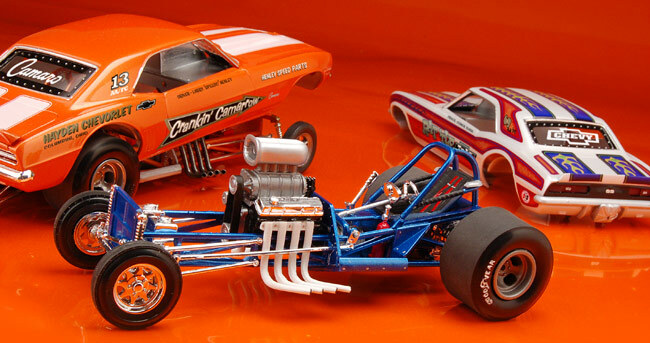 My model is pictured with the narrower front axle found on the chrome tree. When I got my test shot this was the only axle that came in the kit. Both myself and Larry really agonized over this because it made the car look kind of weird. We tried to think of a solution and even pondered using a long straight piece of sprue from one of the trees for the axle and noting it on the instruction sheet. But, I ended up just using what was supplied and hoped it wouldn't look to odd. After living with it for a while I actually like it now. Luckily, before the real kits went into production, RC2/Ertl opened up all the runners on the trees and the correct wide front axle was returned to the kit. So, builders of the production kits can build it either way. 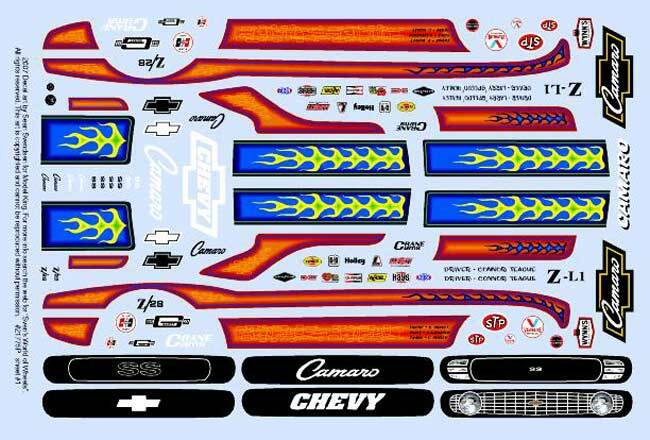 A few months went by and Model King also offered me some other box projects which compressed the schedule for the Camaro. 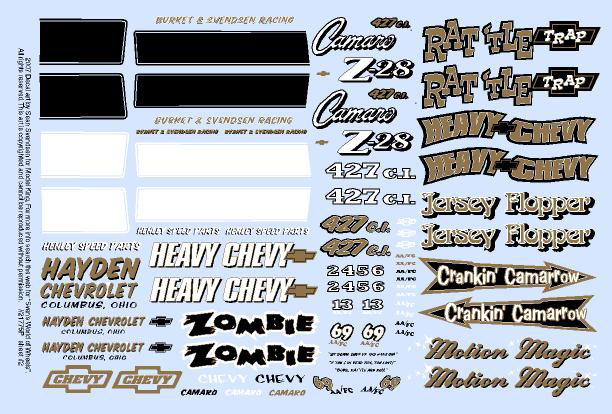 To make matters worse, Larry started having health issues and was unable to complete the work for his decal sheet, so I volunteered to design the second decal sheet for kit as well. With time running out, I decided to forgo the box top illustration I was planning and do all photography for the box. At first, I was afraid that photography by itself would be a little uninspiring but I had little choice. To spice the box up a little, I decided to give the box some retro design elements. I again went to the web and started looking at old rock and roll album covers and concert posters. I took my inspiration from those and photographed the models on a bright orange sheet of acetate which gave the photography some intensity and set off the color in both cars. I also scanned some samples of gold leaf foil that I had and created some 70's style lettering for the box. The final design for the box was born out of necessity but I have to say it ended up being one of my favorites.